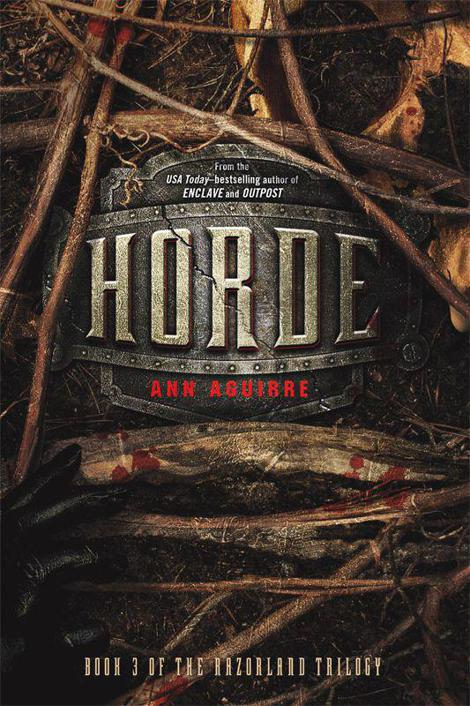 Who/What/Why/Where/How: Horde was one of my book choices for Bout of Books 12. I'm also trying to finish a bunch of the series I have sitting on my shelves. Oddly enough it's usually the last book that needs finishing. What? I have closure issues. Don't judge me. A HORDE OF FREAKS HAS DESTROYED SALVATION, and it's up to Deuce, Fade, Stalker and Tegan to lead the refugees to safety. Deuce decides the only way to fight an army is to raise one. At first, everyone laughs at the idea of a girl leading humanity's forces against the Freaks but, after proving herself in combat, she firmly establishes her qualifications for the role. Along the way, she works on healing Fade. He's suffering from a severe case of PTSD in an era when diagnosis is impossible. Further complicating recovery, and their burgeoning romance, is his reluctance to being touched, a consequence of the horrors visited upon on him by Freak hands. Deuce refuses to give up on him, however, and their resulting tender moments are all the more moving for being hard won. When Deuce learns the reason the Freaks are getting smarter, she realizes time is running out for her kind. Can she overcome or render a permanent truce with the enemy? Who will ultimately survive? Let me start by saying that it's always been a challenge for me to finish a book series that I love. It stems from my anxiety of not wanting a much loved story to end. And yes, I know I can always re-read the story and revisit my favorite worlds and characters again but, it's never the same as reading it for the first time. So I end up dragging my feet until the need to know what happens overwhelms my anxiety. I know. I'm weird. I never promised I wasn't. ;-) But enough about me and my quirks. Let's get this review going. I won't be right for a few days but, I'll soldier through. What choice do we have, right? On the flip side of all that doom and gloom, you'll get to see Deuce grow and become an amazing woman and leader. You'll see Fade deal with his issues as he stands loyally by Deuce's side. And you'll get the added bonus of watching old and new side characters grow into their own. If you haven't picked up this series yet and you love post-apocalyptic tales do yourself a favor and scoop this series up. Ann Aguirre delivers an incredible story, with excellent world building and amazing characters. You can't go wrong with that combination. I feared a love like this - that made us incomplete without each other. It was beautiful but treacherous, like snow that looked white and pure and lovely from the safety of your window, but when you stepped out to touch the softness, the cold first stole your breath, and then your will to move, until you could just lay down in it and let the numbness take you. Yet I didn't want to be without him either, so I didn't chide him back, even if Fade had believed he was broken beyond fixing. It's funny that I have this book on my stack to read soon. Smart Zombies....who knew. Right?! We did our first joint review for book 1. I read it the other day and damn near laughed my face off. We're a good team.